Hundreds of corporate groups have rafted with us since 1983 because we have two beautiful, riverside base camps that have comfortable space for socializing or meeting before and after whitewater raft trips. Our facility on the Kennebec River in Maine is perfect for overnight gatherings – complete with many lodging options, restaurant, pub and large conference space. Our base in Massachusetts sits on the Deerfield River and includes space for meetings, relaxed gatherings, meals and socializing after raft trips. Why choose Crab Apple for your Corporate trip? World Class Whitewater: The Kennebec runs daily for groups looking for big excitement. 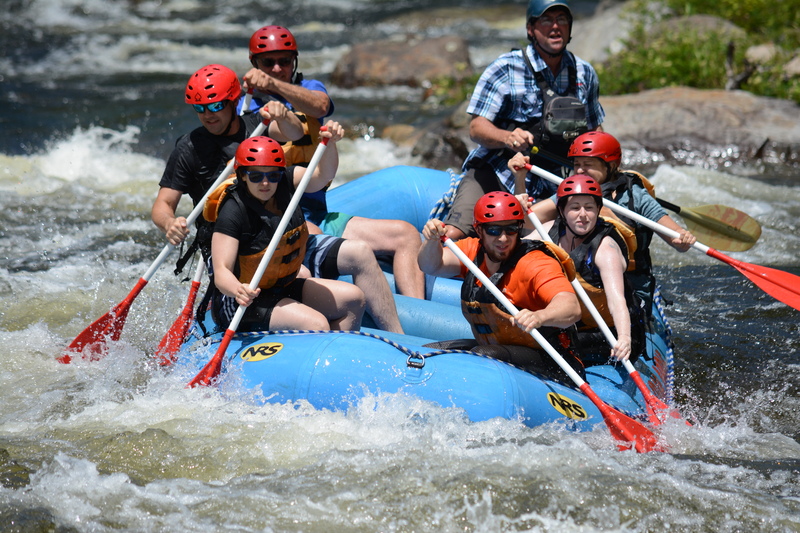 This is the most popular river trip in Maine and will thrill your group with world class whitewater. Note: Kennebec prices do not include $5pp state and river access fees. Note: Dead River prices do not include $12pp state & river access fees. Our Most Popular Group Trip: The Fife Brook trip is perfect for groups with varied ages and athletic abilities. Many groups choose this trip to emphasize team skills, great fun and camaraderie. New for 2019: We will run two trips on this section of river – the classic ten mile trip (6 hour total experience) and a seven mile trip (5 hour total experience). The ten mile trip is the trip we have run since 1989. The new 7 mile trips save groups a little $ and take about one hour less time. Most Aggressive trip in Massachusetts: The Monroe Bridge trip offers aggressive, continuous Class III-IV action. Guides and paddlers work closely together to make this an action-packed trip. Action Packed Intermediate Trip: The West is a special trip for groups looking for aggressive intermediate whitewater along with great views through Jamaica State Park. The trip meets at Mount Snow Ski Resort on two weekends each year – a perfect place for meetings and relaxation.